Hey, y’all! So, the mother in law, Karen is in town and has one of the greenest thumbs I know of – she and the Hulk are in competition. She motivated Mike and I to try our hands at gardening and I love it! I’ve actually tried planting a few things in the past and had very little luck (they all bit the dust). But, I thought it was time to try again! We had some morning glory seeds that had been sitting for two years in our junk drawer in the kitchen. I decided that we could get them started in a wet paper towel for a few days and then try planting them. Well, to my surprise, after a couple days they started to sprout! I quickly planted them and crossed my fingers! Seriously, days later, I had a handful of plants breaking through the soil. It’s now been three weeks and they are going wild!! No flowers yet, but the leafy vines have me amazed and wanting more! I actually planted the seeds in two places – a large round pot and a long rectangular box that my failed herb garden had once lived. 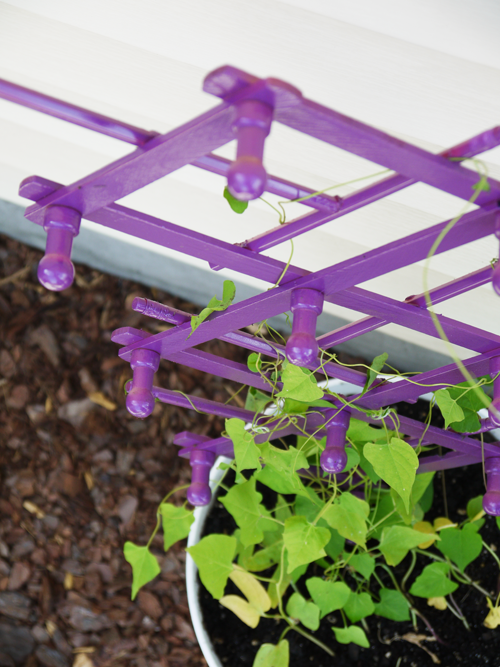 In the pot, Karen had bought a simple metal trellis for the vines to wrap around and grow up. The other batch of morning glories were climbing up each other and anything they could wrap their little green tendrils around. We needed a structure for them to climb and quick! Since joining Pinterest (a social idea sharing website), a few months ago, I have a new outlook on DIY projects and saving money. 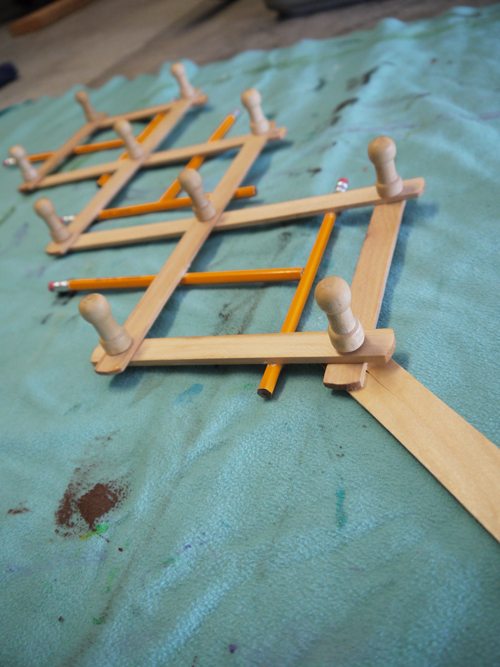 I was inspired by the trellis shape and started thinking about other objects that have a similar shape. 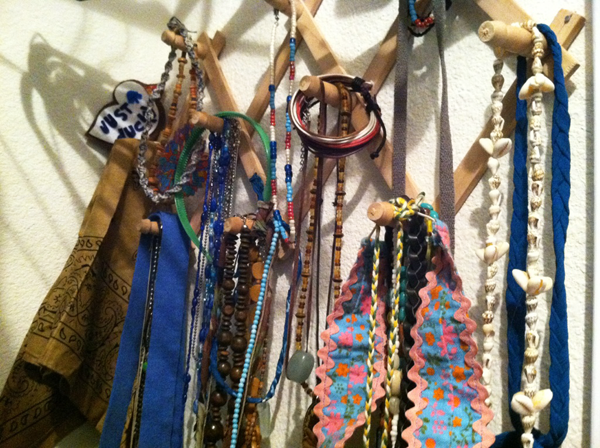 Aha, an accordion peg rack! I have one in my closet full of jewelry, belts, and misc. accessories. I didn’t want to unload that, so I bought a new one for a whopping $1.50 and got to work. Mike helped me disassemble the rack, tighten the screws, and replace others with bigger ones to add strength and stability. We then attached a paint stick to the bottom as a stake and reinforced all the screws with liquid nails (my new best friend). Being a very visual person, I wanted it to be more interesting to look at, so we added pencils! 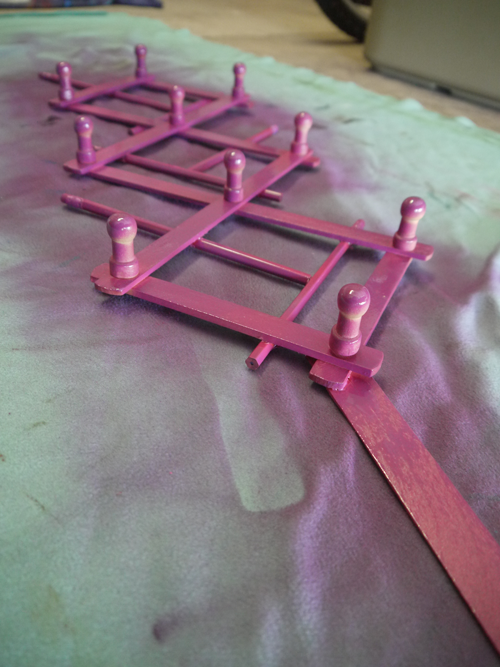 We were gonna leave it like that and then clear coat it, but I wanted to unify the pieces and make it look official – so purple spray paint, it was! We now have a super cheap, super cute trellis holding up our morning glories and adding a burst of color to our front porch. I will warn you, if you try this at home, you may want to add a strip of wood through the middle from top to bottom for extra strength. Ours is a bit wobbly, but it works for now! I LOVE this idea and it looks like it came out great! Where did you find a rack for $1.50? Most I’ve seen are at least $20. It’s one of those old fashioned accordion style racks. I think it was at a flea market, but it was brand new. I just searched Amazon and they aren’t too bad on there. Good luck and send me a pic, if you try it! Go to good will . Got one today for $2.00!